I have had a very stressful week at work and home. One night I needed something that was simple to make. I threw this together and it turned out very good. It certainly didn't hurt that I got to take out some of my frustrations with a meat mallet! Whisk together the oil, lime juice, garlic, cilantro, and cumin together for a marinade. Place the thin meat into a gallon Glad ziptop bag. Pour the marinade into the bag and massage around to mix thoroughly. Let marinate for 1-4 hours. Preheat a charcoal grill to 450f (medium-high heat). 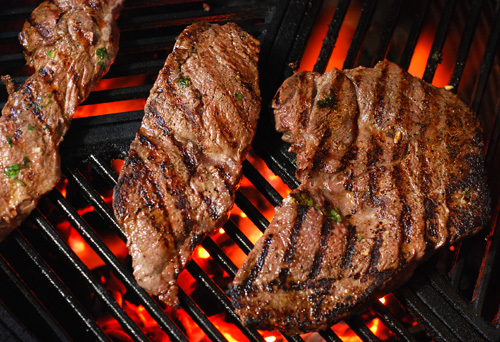 Remove steak(s) from marinade and pat dry. Season with salt and pepper. Grill for 3-4 minutes per side. 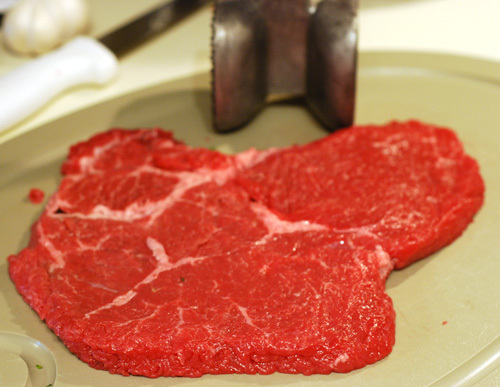 Rest steaks for 5 minutes and then slice thinly across the grain. 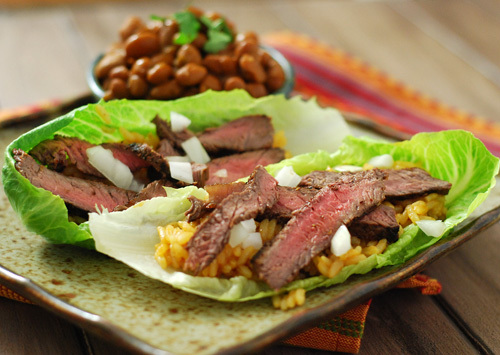 Lightly spread 1/4 cup of the Spanish rice on each of the lettuce leaves. Top with some slices of steak. Garnish with whatever you like, diced onion, cilantro, etc. I usually use Bibb lettuce when I can find it but tonight I used romaine heart leaves. Cover on both sides with plastic wrap and lightly mist the wrap with water before pounding the meat. I was going to use flank steak but sirloin was about half the cost. I served mine with Pintos a la Diabla - pinto beans in a sauce with de arbol, jalapeno and serrano chiles. The beans simmered in this 3 chile sauce packs a nice heat, but it's not overwhelming. Oh...it's not a dish I made up. 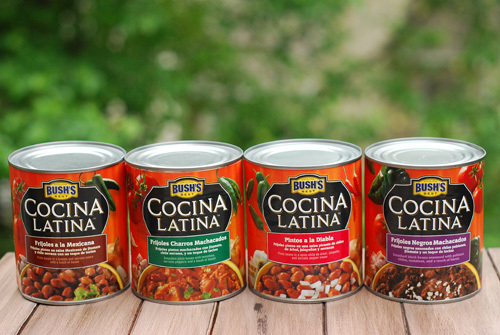 It's from Bush's Beans new line, Cocina Latina. Cocina Latina will be available in select markets, so you might not see it available in every grocery store (you can always contact Bush’s customer service with any questions). My family has tried them all, some as side dishes some as an ingredient, and they have been a hit. My favorite of the line was the Frijoles Charros Machacados (smashed pintos with tomatoes, bacon, serrano peppers and did I mention bacon?). 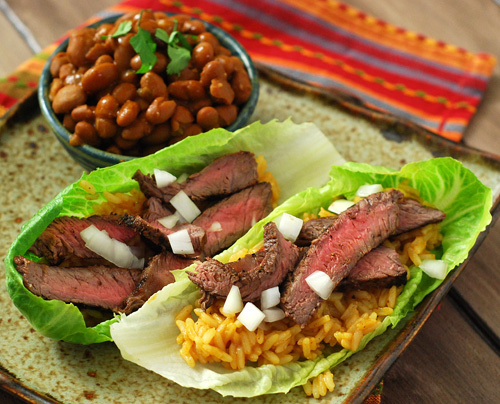 They taste great with just chips, in a quesadilla, or as a side to any Tex-Mex or Mexican main course. Although I like going to BBQ competitions and taking BBQ classes, I have never actually participated in a BBQ competition. It is a HARD JOB and I didn't have the desire to put myself through what the dedicated BBQ competitors do. That ends next month when I will be competing on a team at the world famous Memphis In May. Memphis In May was one of the first contests I ever saw on TV and it helped pique my interest in the crazy world of BBQ. My dabbling into competition BBQ is made possible largely thanks to Bush Beans sponsoring some specific posts on my blog this year. (This isn't one of the posts but they did give me samples of the beans to try.) Thanks Bush Beans!